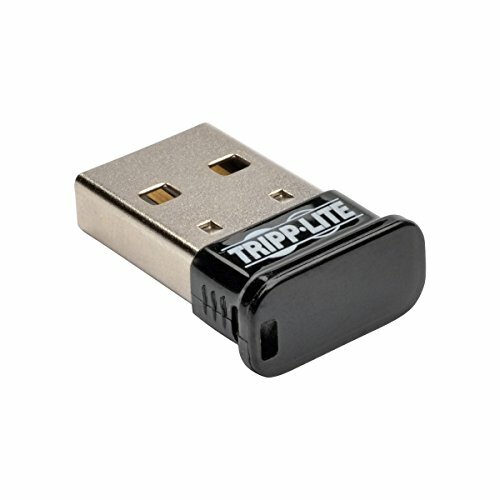 The U261-001-BT4 Mini Bluetooth 4.0 (Class 1) USB Adapter connects to your computer or laptop’s USB port to provide instant Bluetooth wireless capability. Ideal for wireless communication with Bluetooth 4.0-enabled smartphones, tablets, keyboards, mice, headsets and printers, this low-profile device protrudes less than 3/16 of an inch (5 mm) from the USB port, so it can remain connected while your laptop is inside a sleeve, briefcase or backpack. The U261-001-BT4 has a wireless range of 164 feet (50 meters) and supports data transfer rates up to 3 Mbps. You can connect up to seven Bluetooth devices at the same time. It requires very little power to function, and its built-in security ensures your pairing, encryption and authentication remains private. It’s also backward compatible with previous Bluetooth versions. Just plug the U261-001-BT4 into your Windows computer or laptop, and the driver automatically installs.